Super bowl ads, Nike’s “Just Do It” slogan… every year millions are spent creating marketing campaigns to positively shape and market brands. While Ferrari was already a massive, powerful brand in the 1980’s, it is quite interesting to see how television influenced the brand during this era. Miami Vice and Magnum PI, two hugely successful shows featured two Ferraris that today remain iconic Ferrari models. When someone sees a Ferrari 308 GTS, there is a good chance they will reference Tom Selleck in Magnum PI. Rumor has it, Porsche was actually asked first to make a car for the show, however Ferrari ended up being the lucky manufacturer. Lucky not just because of the brands visibility, but also because of the effect the show had on sales. How many Ferraris would you guess were sold as a result of the television show Magnum PI? Our bet, plenty. If you look at today’s sales and prices of used Ferraris 308’s on the market, it confirms that there is a high following and value for this model. There is no doubt the value of a pre-owned Ferrari 308 GTS is a result of the television series success. 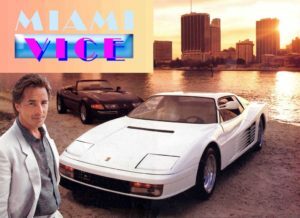 Lets also not forget about Don Johnson donning his white suit in Miami Vice while driving his Ferrari Testarossa and keeping the streets of Miami safe. Again, this show made Testarossas a household brand in the 80’s, having a huge impact on their sales. It is quite amazing to see how these shows impacted, not just immediate sales in the 80’s, but sales today in the pre-owned Ferrari market. The 1961 Ferrari 250 GT California, from Ferris Bueller’s Day Off, is one of the best examples of how movies and television can impact Ferraris. This Ferrari model is one of the most expensive and collectible used Ferraris know to man. Interestingly enough, the actual car in the movie was not a real Ferrari. In fact, the company that made the Ferrari replica for the movie studio received cease and desist letters by Ferrari to stop using their brand, that is, until Ferrari realized the positive effect it was having on sales. At least, that is the story that was told at the Monterey, CA auction where one of the three actual cars used in Ferris Bueller’s Day was recently sold. When a brand is lucky enough to land in a movie or t.v. series that becomes successful, it is remarkable to see the positive influence the brand will receive in the current day and for years and decades to come.